We love geocaching. I have enjoyed geocaching as a hobby for about 12 years. When Drew and I began dating, I introduced him to it, and it became a popular weekend activity for us. 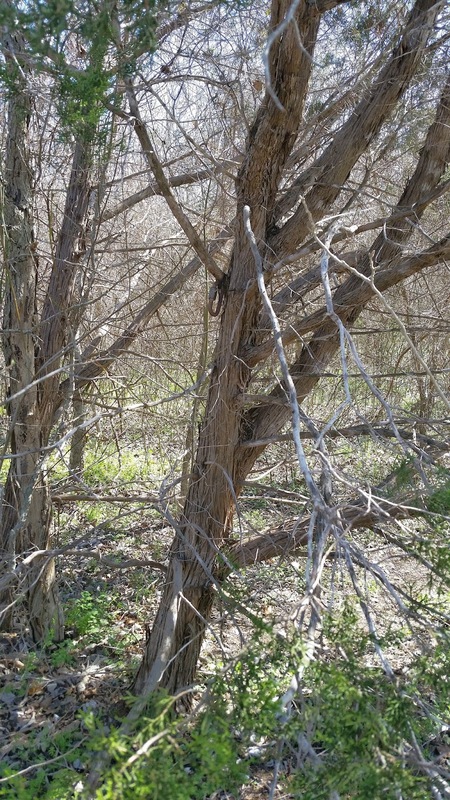 We found that by geocaching, we could explore and see parts of Austin that we may have never seen otherwise. 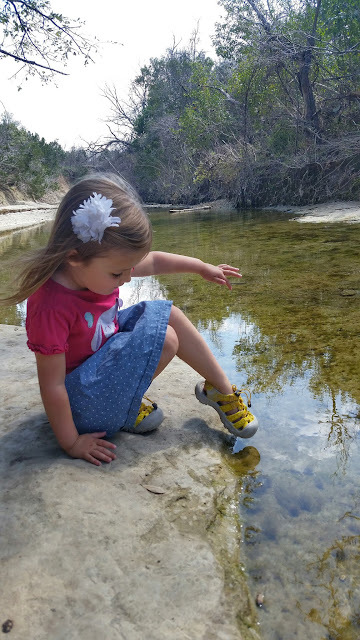 We went geocaching in pretty much every major park in Austin. Geocaching in this amazing city made us fall even more in love with our city. 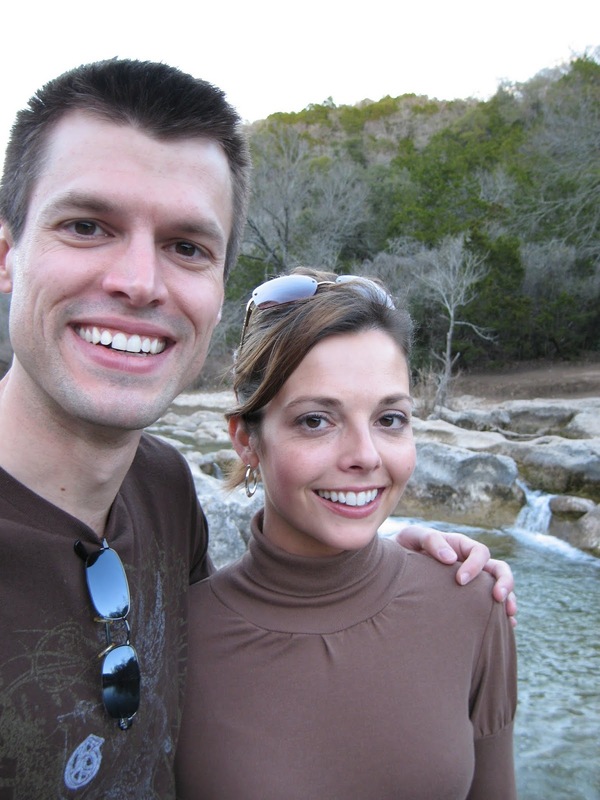 Drew and I while dating---geocaching and enjoying Austin. 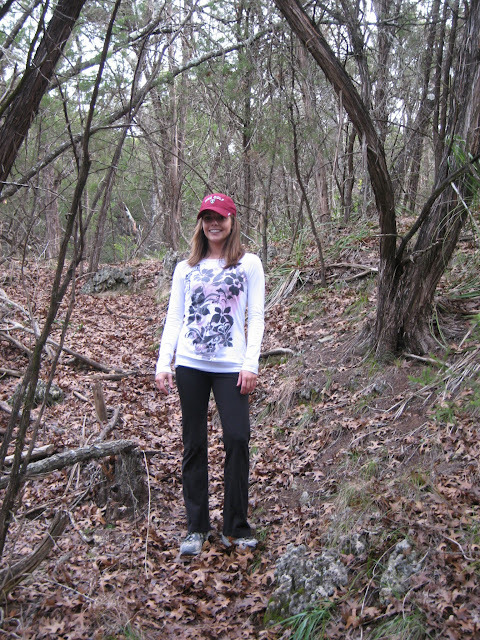 Exploring areas "off trail" thanks to geocaching. Then, we got married and had children. Geocaching happened much less frequently---that is, until the kids got older and were able to go on longer hikes. Lately, we have been doing more and more of it. Geocaching is basically an outdoor treasure hunting game using GPS-enabled devices. You navigate to a specific set of GPS coordinates and then attempt to find the geocache (container) hidden at that location. Today, there are free apps that you can get for your phone that make it so simple. You simply open the app and you can click the "live nearby" caches or the live map to see the caches that are near you. There are caches literally all over the world and everywhere---in neighborhoods, in the suburbs, in the city, at parks, and even under water. It's fun to search for caches when traveling, because it allows you to see areas that you may not see otherwise on your trip. Each of those icons are different caches. These are located in New York City. The app that I use currently is called, "c: geo." (It is an android app though.) If you are an iPhone user, try "geocaching" by groundspeak. Back when I first began geocaching, I used my garmin gps device and entered in my coordinates. Now, you don't have to enter in any coordinates. You simply click on the cache you want to find and it shows you the coordinates and how far away it is, as well as a compass to show you which direction to travel. Easy peasy! There are so many different types of caches. You can click here to read about all the different types of caches, from traditional caches, to puzzle caches, to earth caches and more. The most common cache is the "traditional" cache. These caches vary in size, from micro, to small or even large, but all at least have a log book that you can sign when you find it. I usually just log my find on the c: geo app though so I don't have to carry a pen (some of the caches are too small to hold a writing utensil.) We love the larger containers, because that is where you find the "treasures." You bring something to leave and when you find the cache, you can trade what you have for something in the box. 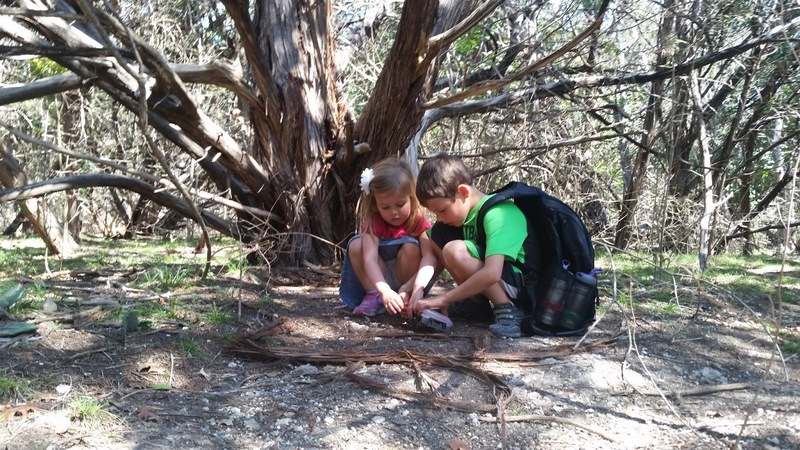 These are the kids' favorite caches! I really enjoy the puzzle caches, but those take a while and can be more difficult with small children. In these caches, you sometimes have to find multiple caches to give you clues or coordinates for the final cache. I love puzzles! Here is a traditional cache we found on a recent visit to walnut creek park. 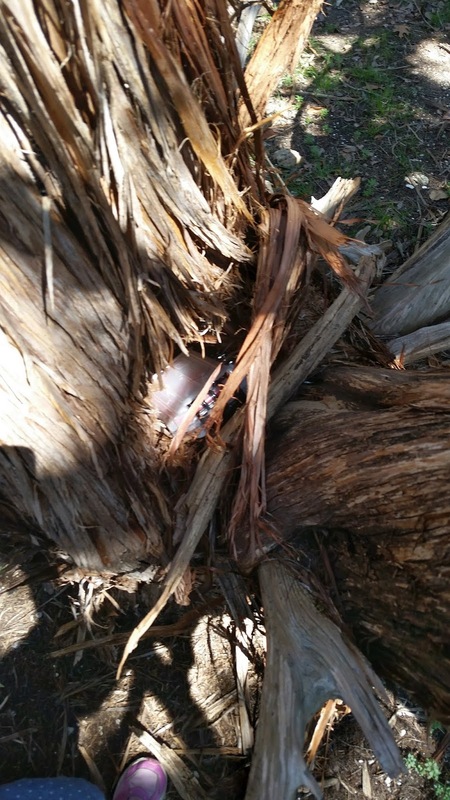 It was hidden in the split trunk of a cedar tree. The kids were excited to open it up and see what was inside. If you want to join the fun and look for your first cache, I would recommend starting with a traditional cache, that is rated with a low number of "stars" for difficulty and terrain. All you need to get started is a GPS-enabled device (the easiest is your smartphone). Download a free app, find an easy traditional cache and you can get started. Bring some little treasures along in case you want to leave something and take something. You certainly don't have to leave anything or take anything though (and you may just want to see what is typically in a cache first). Once you find your first one, you can move up in difficulty, but it is good to at least start with one easy one so you know what to expect. I would also make sure to check the log on your app within the details of that cache. 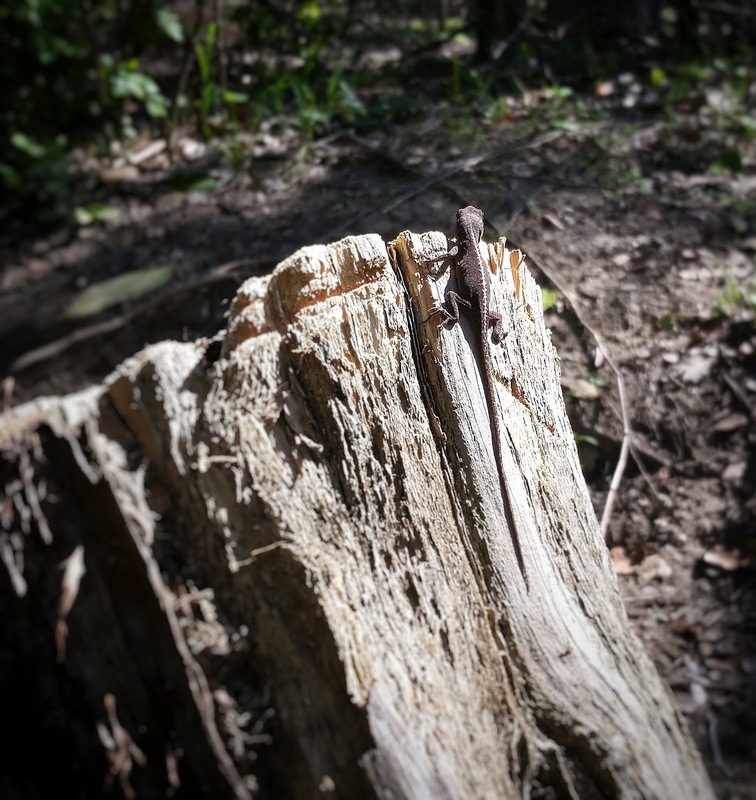 There, you can see logs from people who have recently visited and found the cache--that way, you know it is still there and hasn't been moved. 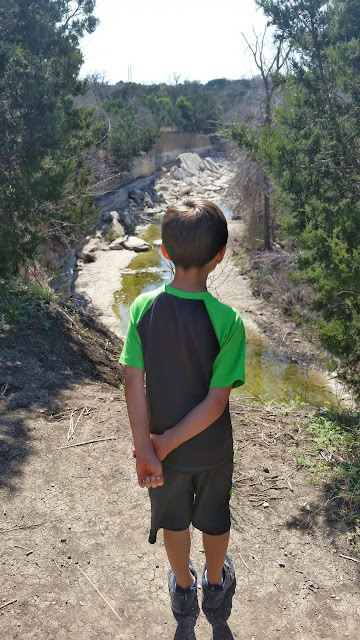 The kids and I have recently been looking for a cache off the trail behind our home--we have tried to look for it on 4-5 different occasions and cannot find it. Here, the log has really helped, because we noticed that in January everyone was saying how easy it was to find. Whereas, in February, folks were saying they looked everywhere and couldn't find it. Our suspicion is that it has been moved. Using the app, you can put a cache on your "watchlist" so that you get notification anytime someone logs about or finds the cache. This way, you can see if others are having difficulty finding the cache too, and can find out if the owner responds or remedies the issue. If/when you do find the cache, sign the logbook and return it to the cache. You can take an item from the cache if you like - just make sure to leave something of equal or greater value in its place. 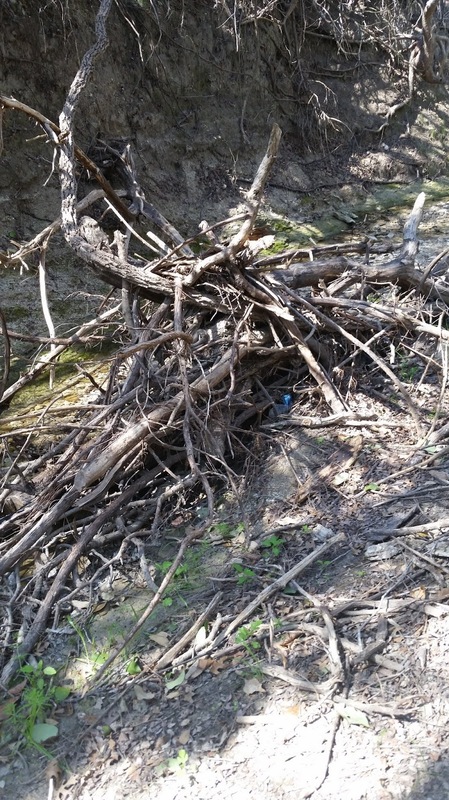 When you are finished, put the cache back exactly as you found it, even if you think you see a better spot for it. Finally, visit the cache page to and share your experience with others. After you find a lot of different geocaches and fully experience geocaching, you may want to hide a cache yourself. If you want to do this, visit here to find out how to do that. 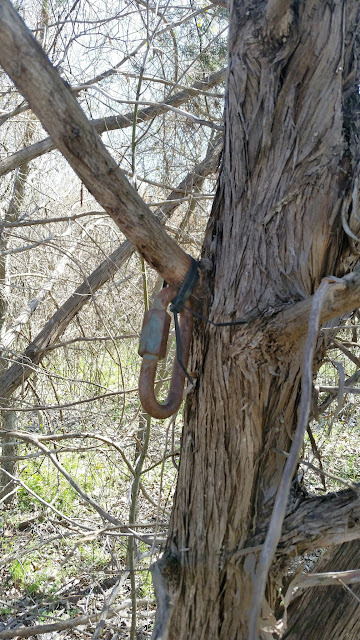 My blog post today is intended to just give you an overview about geocaches and some information to help you get started finding them. Hopefully, that was enough information to help you on your first cache. I think you will find soon that by geocaching you will get to see so much that you wouldn't normally get to see and experience. 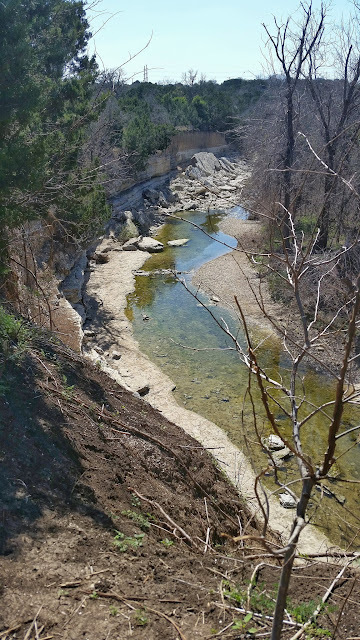 Here are some photos from our most recent cache at Walnut Creek park. The kids wanted to look closely at this mess of sticks. 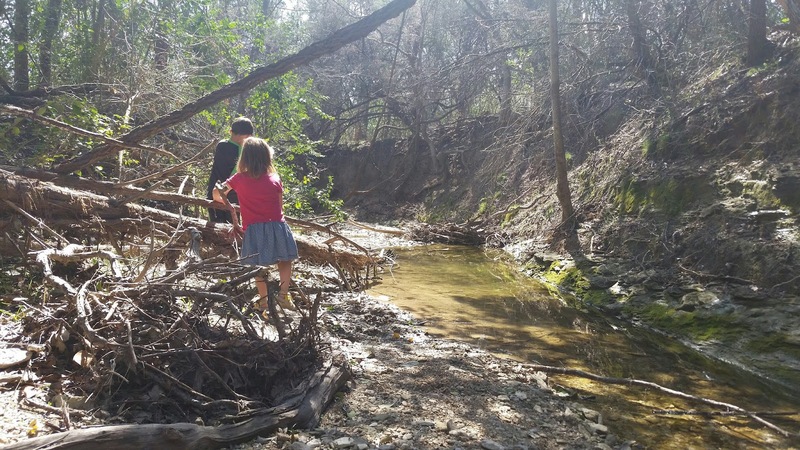 They thought it was a "beaver dam". I told them I thought it was from the flooding last Memorial Day and this past fall. 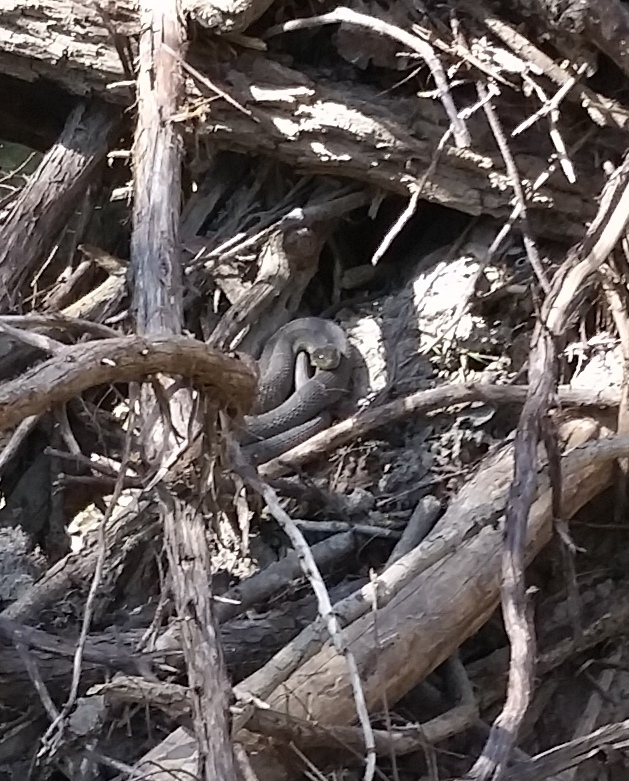 As we got closer, Luke said, "Mommy there is a snake and it is looking right at me. I don't know how he saw him so well. After Luke said that, I zoomed into the photo I had just snapped and saw--the snake truly was looking right at us. This is the same photo as above,just cropped and zoomed in on the snake (that is why it is so blurry). I strongly dislike snakes!! We found a cache that led us to this cliff. See that rusty clip? That is actually the geocache. If you twist the clip open, there is a log rolled up inside. Download the free geocaching app today and check out the caches near you. I am sure you won't have to go far to find your first cache!